For me, spring means asparagus and I anticipate asparagus season as much as I look forward to strawberry, cherry, and blueberry season. Michael actually tried growing asparagus early in our courtship, but the crowns never took and we ended up with an empty raised bed and dashed hopes. We finally decided to give it another try this year using Jersey Knight hybrid plants we purchased from Debaggio’s Herb Farm & Nursery. We selected a spot on the north side of the backyard, which gets full sunlight. 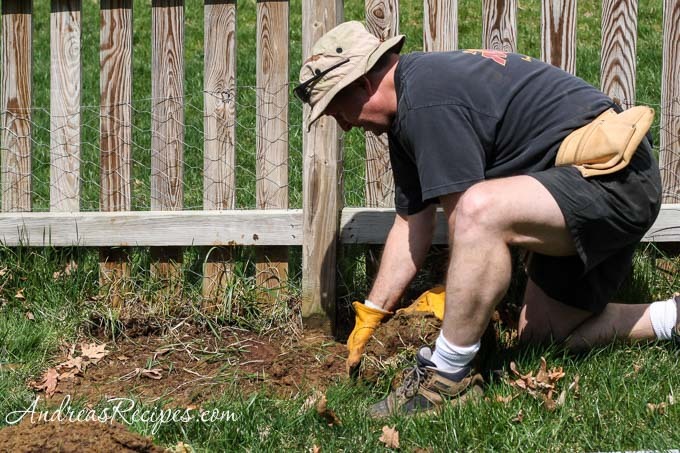 Michael dug up the sod and moved it to some of the bare spots in the yard, then he filled the space with a mix of topsoil, manure, peat moss, and compost. 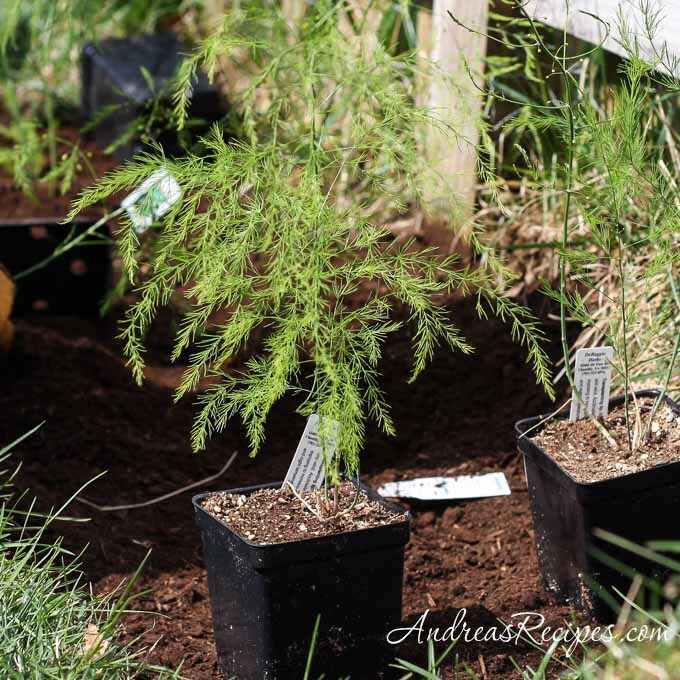 I arranged the asparagus plants about 8 to 12 inches apart, according to the instructions from Debaggio’s. We started with six plants, then depending on how these do we may add more next year. Michael put each plant in the ground, making sure the root system was covered but not too deep. Once we start mowing the yard in a couple weeks we’ll mulch the bed with grass clippings to discourage weeds. 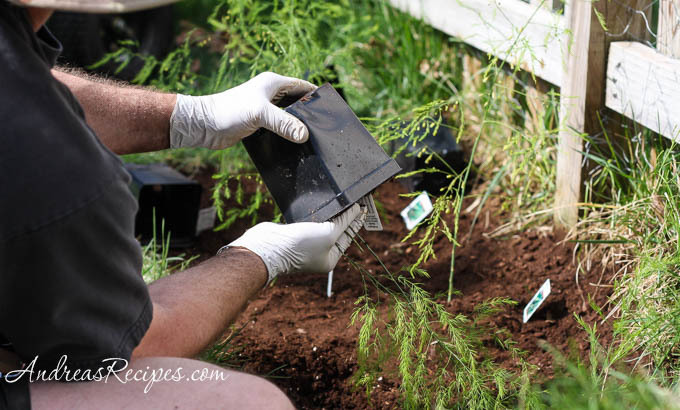 Asparagus needs time to develop roots and produce enough shoots to eat, so they should stay in the ground for two years before the first harvest. That seems like a long time off, but we’ve planted many things that require similar patience, such as rhubarb and the fruit trees and bushes. When it comes to asparagus, we don’t mind waiting. I also think of asparagus when I think of spring but have never actually grown my own. Must be awesome! Hi Maris! We hope to have a good harvest in a couple years. I will be watching with interest. I’ve never grown asparagus, but I think it would be fun to try. I did not know this about asparagus- that it needs a couple of years to get settled. One of my most potent food memories is from my uncle’s garden on the plains; he chopped fresh asparagus out of the garden and we walked back and sauteed it right then… 15 minutes from garden to belly. That is a wonderful memory. I hope we’ll have a harvest of asparagus in a couple years, too.